Electrical issues can be annoying and even dangerous. That is why you want a licensed, professional electrician in your home – even for the small jobs. 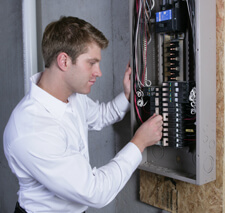 Our electricians have the knowledge and experience to make your repairs in the safest, most cost-effective manner. Plus, we will diagnose your situation and find the root of your problems so that we fix them the first time. As we like to say, “Solutions for problems, not just Band-Aids for symptoms.” When you use Five Star, you can be sure that your electrical system will be up to code and problem free. Depend on us for residential electrical services including repairs, installations, troubleshooting, renovations, and new construction. We can handle anything from fixing a problem with a light switch to installing an entirely new, code-compliant electrical system. Also, we offer an electrical safety inspection to find any potential hazards in your home. When you call, your Five Star electrician will arrive on time in one of our fully stocked, GPS-dispatched trucks. We will provide you an exact quote, not an estimate, up front and in writing so you will know what to expect before we begin. And all of our work is backed by Larry’s guarantee so you can be sure we will get the job done right. You can count on Five Star Plumbing Heating Cooling for all your electrical needs. Call us today to see the difference our professional, reliable service will make in your home! Our friendly and thorough customer service just can’t be beat. We provide electrical service to Greenville, Spartanburg, Hendersonville, Oconee, and surrounding areas.